Patient satisfaction rates and clinical improvement were observed after combination therapy with platelet-rich plasma and laser therapy. Improved outcomes were found when adding autologous platelet-rich plasma along with ablative fractional carbon dioxide laser treatment for acne scars, according to a meta-analysis published in the Aesthetic Surgery Journal. Researchers performed a systematic review and meta-analysis to evaluate the effect of adding autologous platelet-rich plasma to ablative fractional carbon dioxide laser treatment has on the clearance of acne scars. Studies involving patients with acne scars, treatment using ablative fractional carbon dioxide laser with autologous platelet-rich plasma and ablative fractional carbon dioxide laser alone, treatment outcomes, and adverse events were gathered from PubMed, Embase, Cochrane Library, and Web of Science databases. The 4 studies meeting inclusion criteria contained information on 90 patients, with 46 women and 44 men, a mean age of 27.4 years. Overall the clinical improvements of the combination treatment of ablative fractional carbon dioxide laser with autologous platelet-rich plasma (odds ratio [OR], 2.992, 95% CI, 1.529-5.857; P =.001) was significantly higher than ablative fractional carbon dioxide laser alone. Investigators found that the duration of crust was significantly shorter in the combination treatment of ablative fractional carbon dioxide laser with autologous platelet-rich plasma (standard mean difference, -1.14, 95% CI, -1.651 to -0.629, P <.001) than the ablative fractional carbon dioxide laser alone. Patient satisfaction was also higher in the combination treatment of ablative fractional carbon dioxide laser with autologous platelet-rich plasma (OR, 3.169, 95% CI, 1.51-6.651, P =.002) than the ablative fractional carbon dioxide laser alone. 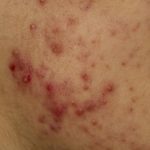 Limitations of this study include heterogeneity among the studies, not including double-blind studies, and the lack of a consistent universal assessment tool for acne scar improvement.